If you ask Karin about her job description, the answer is straightforward: Bring joy into people’s lives. A Certified Laughter Yoga Leader and a graduate of Dr Madan Kataria’s Laughter Yoga University, she has been conducting uplifting Laughter Yoga classes since 2013. Laughter Yoga can serve as a natural anti-depressant: it keeps people of all ages in high spirits and fosters emotional and physical well-being, regardless of your physical and mental state. The best synonym of Karin’s Laughter Yoga session? A joy to behold. A stickler for healthy emotional lifestyle, Karin conducts workshops for corporate clients, NGOs as well as one-to-one classes. She has helped the elderly and oncological patients to rejoice against all odds. And she also works with the little ones, organising science classes for kids at “Małe Mądrale” (“Little Wise Guys”). 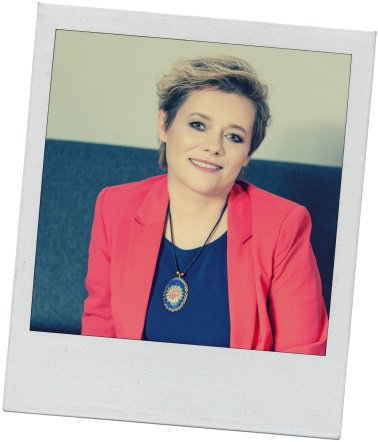 Karin co-authored an online personal development course “Wiem, czego chcę” (“I know what I want”) and its analogue follow-up “Dziennik Rozwoju” (“Development Journal”). Her passion is connecting work with … passion, and vice versa. At home, she is a mother of three, who likes being around people, travelling, cooking and … helping others – provided all of the aformentioned activities are filled with joy. Why Laughter? Why Laughter Yoga? Scientific research proves that we learn better, more and faster when learning is filled with joy and happens through play. Irrespective of age, laughter and joy enhance learning and training.